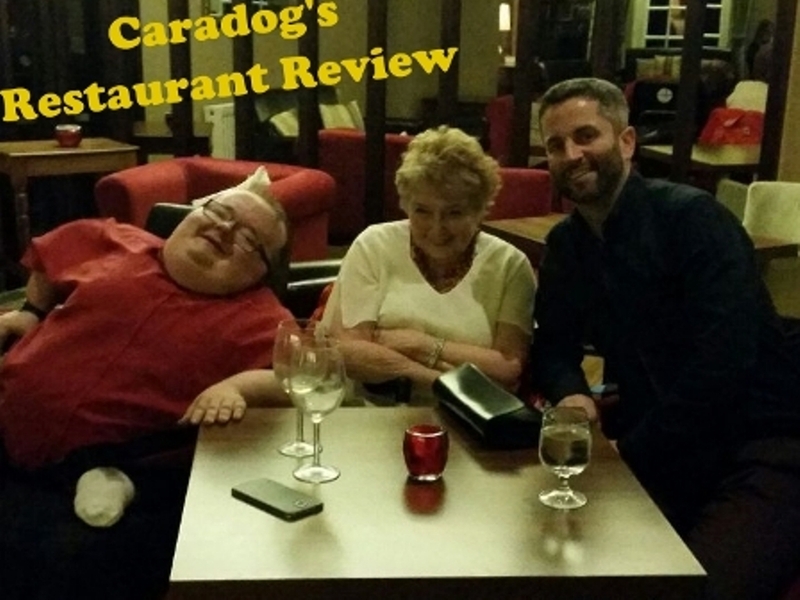 Recently Greg, my Mother and I went to Caradog’s it’s the restaurant in the Ty Newydd Country Hotel in Penderryn. Unlike Greg and my Mother I’d been here a couple of times, so knew what to expect…. or so I thought. 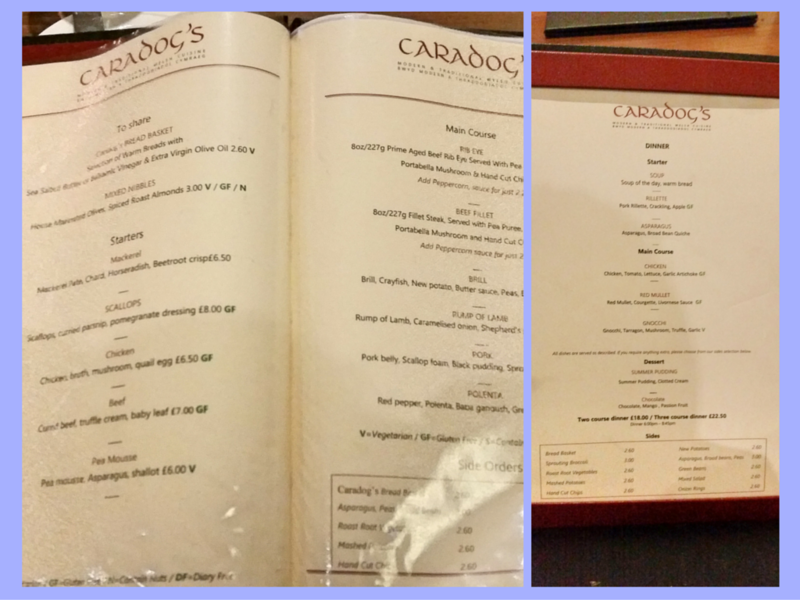 On the website the menu was quite extensive, and had dishes that my mother, Greg and I all liked the sound of. However, when we arrived, I personally was disappointed. The menu wasn’t a patch on what was online, I personally felt it was very flat and one dimensional. Some of the dishes lacked the spark of what I’d read both online and on previous occasions. 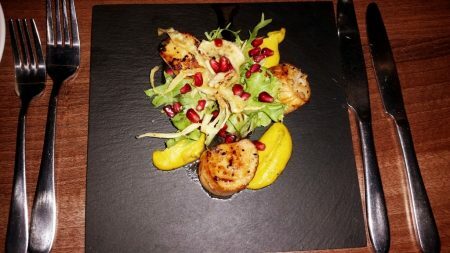 My Mother and Greg had the Scallop starter, it was described on the menu as “Scallops, curried parsnip, pomegranate dressing”…. description literally says it all. They really enjoyed this, the scallops were cooked to perfection, my mother said the Curry Parsnip Purée wasn’t too overpowering. The Scallops were succulent with a slight char on the outside but sweet soft flesh inside, just how they should be cooked. 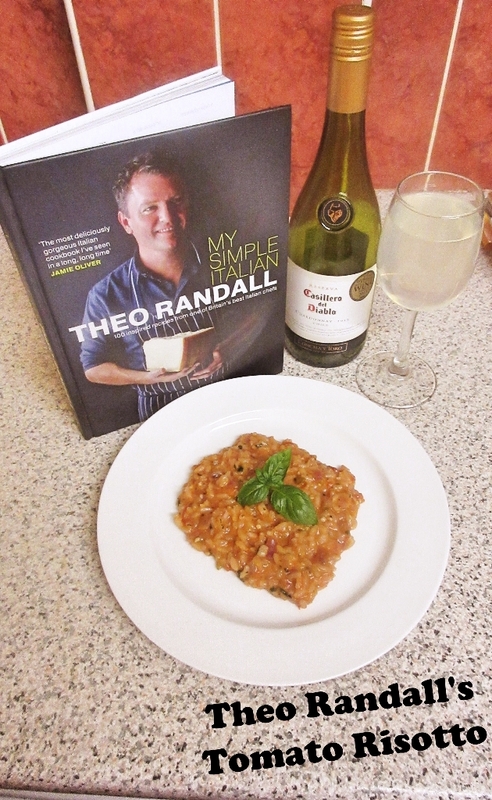 I always admire someone who can cook a scallop because it’s not easy, funnily enough (not wanting to brag) I’ve had my “Scallops with Curried Cauliflower Purée and Smoked Bacon” recipe shared by the foodies 100 website in their top 20 Scallop Dishes. 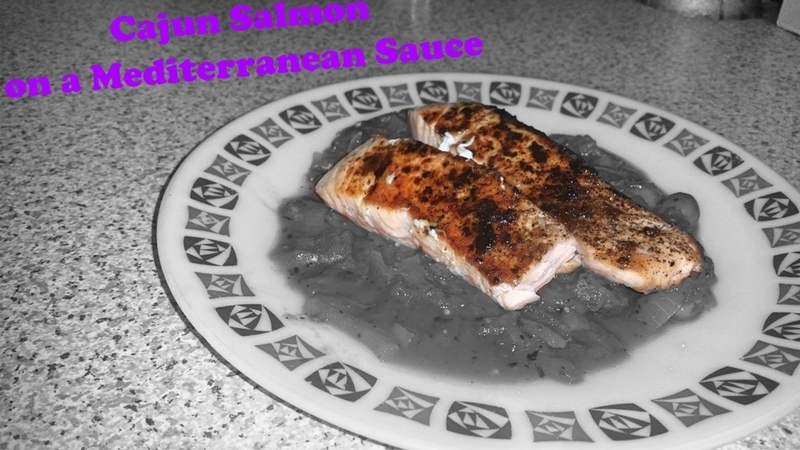 Click here to read the original recipe which was part of last year’s mother’s day meal. 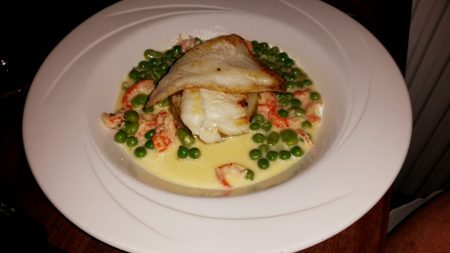 I couldn’t have gone a whole meal without having some fish, so my Mother and I decided to go for the Brill for my main course. I’m not going to lie, this again was a dish which when reading it appeared to be the main course I least disliked. Urgh Urgh (sound of the family fortunes buzzer) I was wrong again, this was stunning, it was described on the menu as “Brill, Crayfish, New potato, Butter sauce, Peas, Broad beans” It was sensational, the fish was flakey and soft, it was cooked to perfection, the sauce was velvety and buttery. I can’t knowingly remember trying Crayfish but they were little jewels dotted around the place, soft and succulent they added a hint of the sea to the dish. The fish lay on top of new potatoes, potatoes which were buttery and soft, they complimented the sauce excellently. Finally in my eyes the piece de resistance Broad Beans! I never liked Broad Beans as a child, they’ve been something I’ve avoided, until now. You’ll all know I like Cauliflower and Broccoli now which I didn’t when I was younger, well you can add Broad Beans to that list, they were stunning little gems of sweet loveliness, I’ve eaten Broad Beans several times a week since this meal, thanks chef for introducing them to me! This was a triumph and a real testimony to “Never judge a book by its cover”! 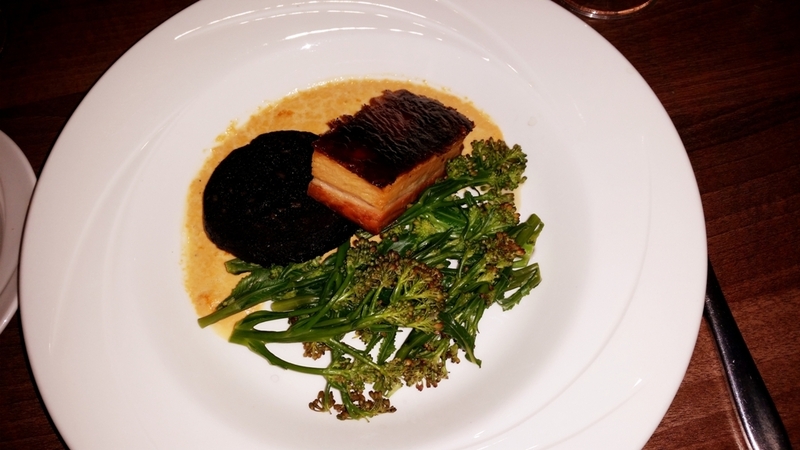 Greg ordered the pork dish, it was described as “Pork belly, Scallop foam, Black pudding, Sprouting broccoli”. The black pudding was salty which accompanied the sweetness of the scallop foam well. The Pork belly was cooked excellently with a crispy top and soft pullable meat. I ordered Orange Cheesecake, it rounded off the meal well with a citrusy note, I like a sharp dessert to end my meal. This was probably my least favourite course though because it had zest in it, and I’m not a fan of zest in desserts. 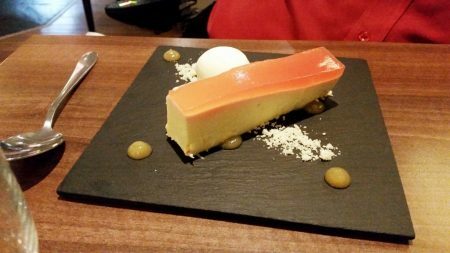 The globules of jell, the ice cream and the crumb complimented the cheesecake but for me, it wasn’t as good as the starter and the main… however, saying that is like saying who do you prefer out of Ryan Giggs, Bobby Charlton and George Best they’re all greats! 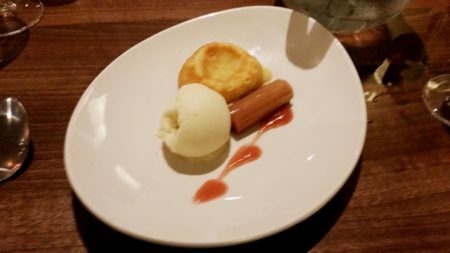 My Mother and Greg had the White Chocolate Fondant, it was accompanied by Rhubarb and Ice Cream. The Rhubarb was a bit difficult to eat, my mother’s nearly shot off her plate but the fondant was warm and chocolaty, yet not too heavy. I wish I’d gone for this dessert now. 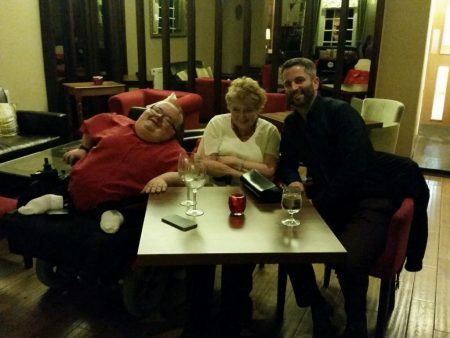 The atmosphere was relaxed and not overly formal, the waiting staff were excellent and there was enough room around the tables for those who may have mobility difficulties. I was really impressed with the accessible toilet, there was lots of room to manoeuvre a wheelchair, and while there were some technical issues which may make it less accessible for those with visual impairments it was spacious and easy to access. 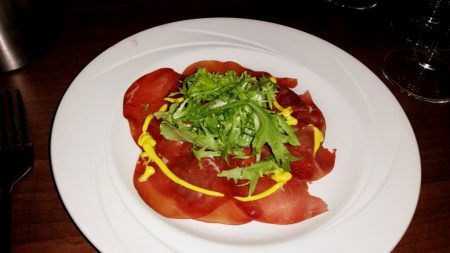 I have to say congratulations to the chef, when I arrived I felt quite despondent because I thought the menu on paper was nowhere near as impressive to that on the website… boy was I wrong. 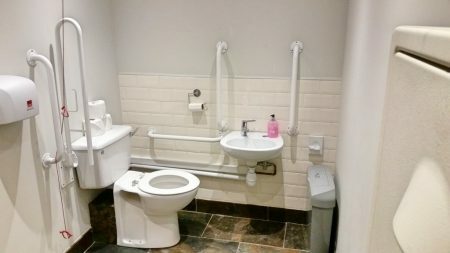 I think it goes to show you should never judge a book by it’s cover – or in this case a restaurant by it’s website. 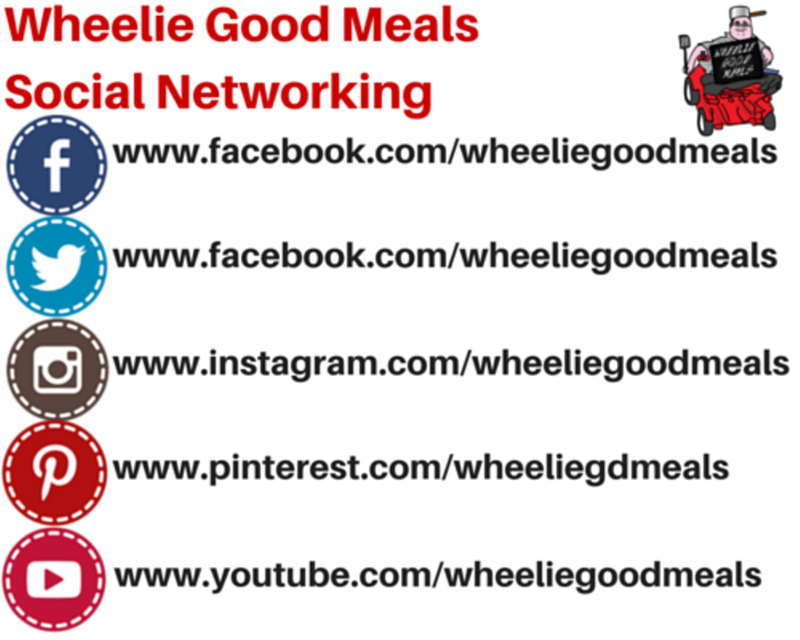 I think I’d probably advise the management to review their website as, when looking back on it today, it says the menu was from November 2015, and we were visiting in May 2016.